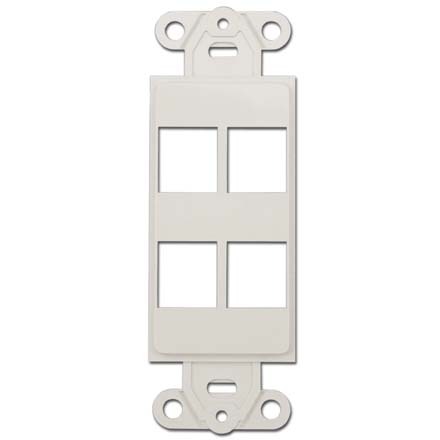 This 4 hole keystone white Decora wall plate insert is the perfect addition to any Decora keystone wall plate and will work with snap-in keystones. *Please be aware that these wall plates have some space restrictions. Keystones jacks that are wider than 18.5mm are not guaranteed to fit side-to-side. Good sturdy material, keystones fit perfect. Had to go with the 3 Keystone Jack since I was able to put Monoprice CAT6 Keystone Jacks side by side. Also, the color of these is more of an ivory white than white. Doesn't match the color of your wall-plates and other wall-plates. Other than that, item works as prescribed and you can't beat the price.